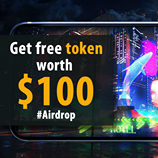 Spheroid Universe is airdropping 1000 SPH tokens to their community members. Signup at Spheroid Universe and complete some easy social tasks to receive the tokens. Also get 250 SPH for every referral.